Mary is our patroness. We call upon her to protect, support and care for us. This she is able to do because of her wisdom and power and her interest in us. She loves us dearly and is eager to help us if we will just call upon her. As individuals we seek her as our patroness. So she is called the patroness of vocations, and of studies. She is our protectress against the assaults of the devil, the tower of David, impregnable wall. She is patroness of homes, of all who wear the scapular and of the sodalities. Members with certain hazardous occupations, such as missionaries, airmen and bull fighters, have chosen her as their protectress. She is the patroness of Catholic countries, and of our own United States. She has been called the salvation of the Roman people. She is the mighty and glorious protector of the Holy Church. A well-defended fortress in defense of her lovers. An invincible warrior in defense of thy servants, fighting against the devils who assail them. Blest guardian of all virgin souls. Bulwark of those who confide in thee. Defender against the evil spirit. Guardian of our peace with God. Guide and patroness of my studies. Helper of all who are in danger. Helper of those in peril. Invincible woman, than Judith more bold. Maiden, patron of the May. Mightier than all the powers of hell. Mighty and glorious protector of holy Church. Most blessed patroness of vocations. Most firm guardian of the holy Church. Most gracious patroness of vocations. Most powerful patroness of vocations. Our nation’s patroness, all fair. Our protectress against the assaults of the devil. Our refuge, who love thee so well. Our strong defense in battle’s hour. Patroness of the house in which we live. Protector and patron of all Christendom. Protector of the children of God. Protector of the Son of God. Protectress of many kingdoms, provinces, dioceses and cities. Protectress of the poor and of the afflicted. Protectress of the Vatican II Council. Protectress, terrible to hell as an army set in battle array. Protects human life from the moment of conception through birth. Salvation of the Roman people. 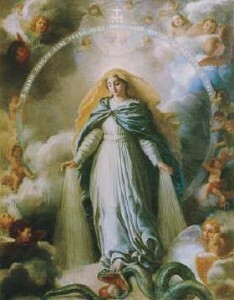 Special patroness of Catholic countries. That powerful rod with which the violence of the infernal enemies is conquered. The guardian of the child in the womb. The strength of those by sin oppressed.